The various divisions supporting Roularta Media Group have kept abreast of the very fast development of the core business. The printing works have been constantly expanded and modernised. In 1972 one offset rotary press and three offset sheet presses for printing magazines were added. 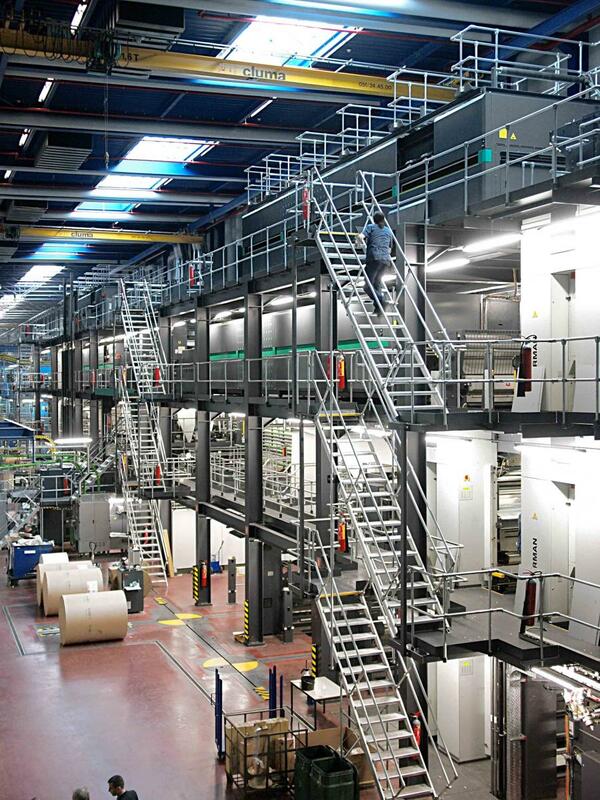 Five years later, work started on a massive new 5,000 m2 hall to house one Harris M 1000 rotary press for printing the magazines and two new Harris offset newspaper presses for the freesheets. The massive expansion in the late 80s necessitated further investments in the printing works, with two Harris M 4000 magazine presses and a Mitsubishi BT1S being installed, together with two hybrid 4-colour newspaper presses, the Harris M 1600 and Euro-M.
2006 saw work starting on building a brand-new printing works. At 19,500 m², the new hall is the size of almost three football pitches. It is now the home of the new MAN rotary presses, including a Colorman heatset which can print 128-page tabloid format in full colour on glossy paper. The Mitsubishi infrastructure has been expanded, now allowing 96-page tabloid format to be printed, also in full colour and on glossy paper. In addition three new MAN magazine presses have been installed: two 72-page presses and one 16-page one for printing glossy covers in vivid colours at a rate of 100,000 copies an hour. This makes Roularta one of the most advanced printer's in the whole of Europe. The pre-press department has also been the subject of constant modernisation. Back in 1977 the department operated completely mechanically, with the first computers for phototypesetting introduced in 1977. Automation and, at a later date, digitalisation were introduced at a relentless speed, making the pre-press department one of the most sophisticated in the whole of Europe. Via the Ghent PDF Workgroup, the Roularta standard for the transmission of advertisement and editorial content has been adopted by the whole printing and advertising world throughout Begium and the Netherlands, and increasingly in France as well.